Siblings need to know about infant safe sleeping practices too! Whether they are 3, 6, 12, or 18 years old. 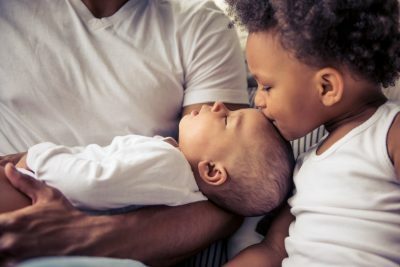 Siblings interact with their infant brother or sister the most, second to mom and dad. They witness the bedtime routine and may sometimes even help. It is important to teach them how to put their siblings to sleep safely. How you talk about infant safe sleep with your older children may change over time. However, the basics of infant safe sleep remain the same no matter the age of the sibling. Remember the ABCs of Infant Safe Sleep: Alone, on the Back, in a Crib. For young siblings, a new baby can be a big adjustment. Depending on their age they may want to be like the baby or they will want to be helpers. Here are things that you can teach them to make sure that your baby sleeps safely and ways that they can help. For younger children, the most important piece to teach them is “Alone.” Young children find comfort in stuffed animals or blankets, but those same items can be hazardous to babies. Young children think that because something is comforting to them that it must be the same for others. Teach your child to keep all stuffed animals and blankets out of the crib, even if they are just trying to help. It is also important to teach a young child that the baby always needs to sleep by themselves in a crib. Sometimes young siblings want to sleep in the crib too once the new baby comes. However, depending on the weight of the child, the sibling can break the crib or portable crib, which then makes the sleeping environment unsafe or unusable for the infant. And in some cases, the sibling may climb into the crib with the baby to sleep with him/her. This is unsafe and increases the risk of injury and death due to bedsharing. Teach them to participate in the bedtime routine. Try to have them practice quiet time before bedtime and when they wake up in the morning. Have them pick out a bedtime story and read it to both children. It’s never too early to start reading to your children! Teach them to play with the baby during supervised tummy time! This is a good time for your older child to show off their stuffed animals and toys to their sibling instead of in the sleep environment. Children around this age are eager to help mom and dad take care of their baby brother or sister. They want to feel like they are being helpful and making their parents happy. These little helpers may offer to help feed the baby, dress the baby, or even want to help put the baby to sleep. At this age, alone and crib, are especially important to teach your older child. 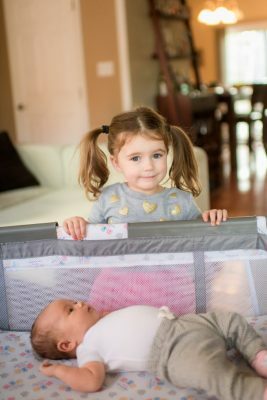 If the infant wakes up and the sibling hears them before the parents can respond, a sibling may pull the child out of the crib (again, thinking they are being helpful) and put the baby in bed with them. This is very dangerous as the soft items that older children have in their beds are dangerous. And as stated above, bedsharing increases the risk of injury or death. If you started teaching them what is safe and what is not safe early, you will need to reiterate a few points with more detail and can give better reasoning. You will need to reiterate that soft items are not safe for babies and can lead to suffocation. You can also explain at this age, that a baby needs to sleep alone and without anyone around them and how sleeping in bed with a person can increase the risk for suffocation or injury for the baby. At this time, you can also teach them about why babies sleep in cribs and how they are the safest sleep environment for them. If the child is strong enough and tall enough to put the baby down to sleep in a crib, you want to make sure they know to always put babies to sleep on their back. Have them help dress the baby for bedtime. Have them dress the baby in a sleep sack and explain why that it is the safest alternative to regular blankets for babies. Have them read a bedtime story or sing a lullaby to their sibling. If using bottles, the older sibling can give the baby a bottle before bedtime. 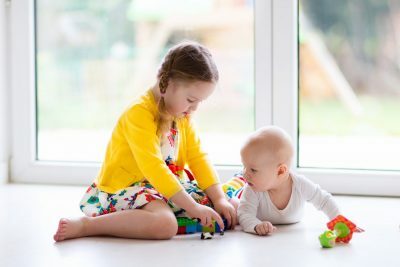 At this age, many siblings may stay at home with the baby while mom runs an errand, or they may be the designated “babysitter” in the family. It is important that they understand the importance of infant safe sleep most of all. A sibling at this age is old enough to understand and follow all of the safe sleep guidelines. They will need to know these safety recommendations if they will be responsible for an infant during naptime and/or bedtime. Alone means, nothing and no one in the crib with the infant. No soft bedding, no bumper pads, no pillows, no blankets, etc. Back is best. Babies should always be placed to sleep on their back. Back sleeping works and was responsible for reducing the sleep-related death rates in the United States by over half. Cribs are the safest place for babies to sleep. Babies should never sleep in an adult bed, on a couch, in a swing or stroller, or in a car seat outside of a vehicle. If an infant should fall asleep in any of these locations, the baby needs to be removed to their crib or portable crib as soon as possible.